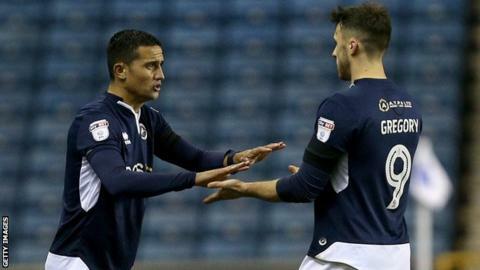 Australia international Tim Cahill is "nowhere near being at his best" for Millwall, says Lions boss Neil Harris. The veteran forward, 38, made his second debut for the Championship club in Friday's 1-1 draw with Cardiff City during second-half stoppage time. "He needs a lot more minutes on the training pitch and in behind-closed-doors games to really get him up to speed," Harris told BBC Radio London. "How long before he is ready to start a game, we'll have to see." Cahill rejoined Millwall last month on a deal until the end of the season, with the aim of securing a place in Australia's squad for the World Cup this summer. He began his senior career with the Lions in 1997, scoring 57 goals in 251 appearances before moving to Premier League side Everton in 2004. Cahill had been without a club since leaving Australian A-League outfit Melbourne City in December, and he was named on the bench against the Bluebirds after scoring for Millwall's under-23 side last week. "I felt on Friday he would give the place a boost and lift the crowd and us as a group," Harris, 40, added. "He is great in the dressing room. The players respect him and he gives us extra leadership and that added Millwall experience. "His standards around the place and on the training pitch are fantastic and he has made it clear he is here to help. "If he gets up to speed in the next few weeks and is ready to start a game then fantastic. If he is not, then he has got a massive part to play from the bench."